Having set-up your new Turnitin assignment within Blackboard (article), there are a few checks to ensure that students won’t have early access to their grades. With these set, a student will be able to submit their work, and receive their grade on the date/time set by you when you created the assignment. As Turnitin is linked through Blackboard, the grades are sent through to the Grade Centre. This is where you need to confirm that grades won’t be seen early. On the page that follows, check that all the options within section 3 are set to “no”. If any are on “yes”, then change them to “no” and click submit to save the changes. These settings should be checked whenever changes have been made at the Turnitin end to the “Post Date”, and “Reveal Grades to Students only on Post Date”, or even if you just click the “submit” button. Clicking the Edit Assignment > Submit button, as shown in the screenshot is likely to show the Grade Centre column. You will need to manually hide the column as shown above. By default, each Grade Centre has a “total” column. 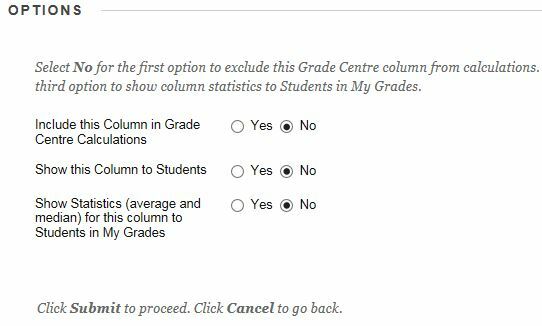 This is a running total of all the grades for a student where the column grades are being included in Grade Centre Calculations (one of the options in the screenshot above). This total column can therefore, potentially, be a used as a way for students to work out their grades. If you aren’t planning on using the total column within your course, then it is good practice to hide the column. On the “Post Date”, students will be able to access their marks and feedback via the route where they submitted their assignment to Turnitin; i.e. they browse the Blackboard site to the area where you created the assignment. They click the Turnitin “view/complete” link, and are taken to the Turnitin area where they can see the marks and feedback (assuming that you have been using the Turnitin GradeMark area). At the same time, Turnitin should also be making the Grade Centre column for the assignment visible, and so the marks will appear in the students My Grades area of the course. However, if you have amended the Post Dates or made other changes to the Turnitin assignment options from when it was first created, you may find that the column will not automatically revert to a visible state. 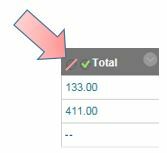 When in the Grade Centre of Blackboard, you can tell if the column is hidden by the icon to the left of the column name. If this is the case, you can manually make the column visible by clicking the chevron icon to the right of the column name, and selecting “Edit Column Information”. 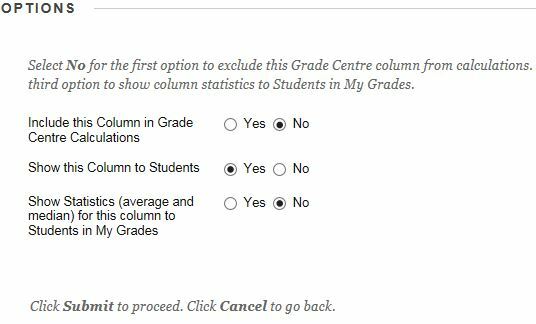 On the page that follows, set the “Show this Column to Students” to “Yes“, and click “submit” to save the changes. The hidden icon should now have disappeared.